We all have those days when we have a craving for something sweet, delicate, well made, beautiful to the senses and of course decadent. When these cravings attack, a cheap chocolate bar doesn't fill the void, neither does a production line cake from the grocery store. 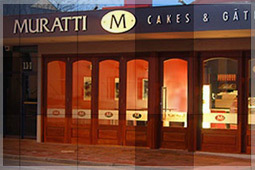 Stop the search and head to Muratti Cakes and Gateaux on Prospect Road. There is something to satisfy each palate; buttery croissants, rich elegant gateaux, cute little biscuits, perfect individual tarts, decadent eclairs and wholesome cakes. Choosing one or a couple can be difficult, however their staff are very friendly, patient and know a lot about the products on display. If you are unsure and you feel like something specific, let them know, they might point you to a new taste or texture that will become your new favourite. Highly recommended: eclair and lemon meringue tarts. Coffee and other hot drinks are available to pair with your pastries and if you don't have much of a sweet tooth Muratti's also serves savoury food. The quality of their products and service is reflected both inside the shop and through their catering service. If you have an event coming up - however big or small, give Muratti a call, your guests will be delighted with their cakes, danishes and sweet or savoury foods. So whatever the occasion is - coffee and cake with a friend, a daunting first date, craving indulgence or event catering - head to Muratti, you will leave satisfied and perhaps even carrying some treats for home. Why? For great quality cakes and pastries. 5 Books to Inspire Your Inner Traveller.